Yes, WE CLIMB UP THE SLIDE! Yes, we do climb up the slide. and here are a few reasons why we think you could reconsider climbing up and allowing the children in your care to climb up the slide too! 1. Climbing up the Slide uses MUSCLE! 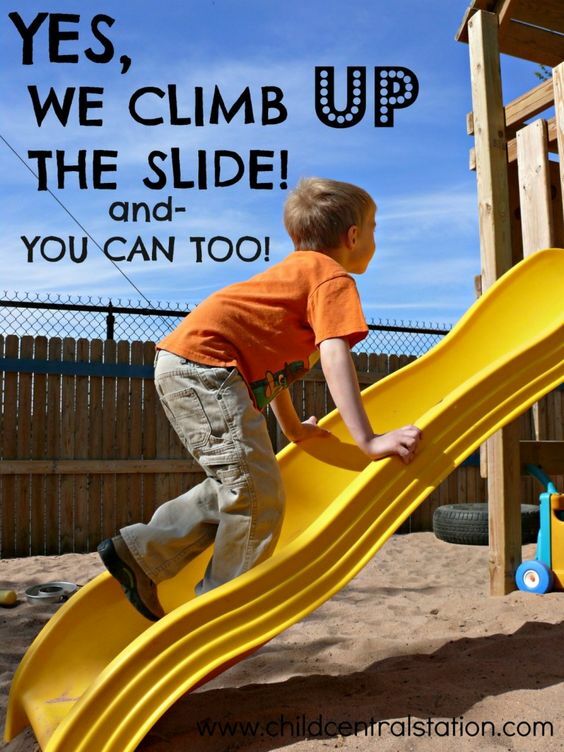 Young children need to be active and climbing up the slide requires a lot of muscle and coordination. It is not an easy feat- and requires strength, concentration, determination, and will power. 2. Climbing up the Slide is RISKY! Yes- climbing up the slide is potentially risky, but so is sliding down! Your job as a caregiver is to carefully observe and monitor the situation, to be close by- but not to interfere unless necessary. Part of a child's learning process must include managing risks- climbing up the slide is a perfect way to practice this skill. 3. Climbing up the Slide involves potential CONFLICT! 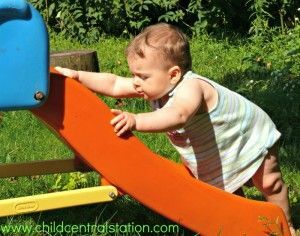 It is almost inevitable that when one child decides to climb up the slide, another will want to slide down. This is the perfect opportunity for children to practice communication and conflict resolution skills. If the children are too young to do so on their own, your job as a caregiver is to help broadcast the situation and to help them resolve the conflict. If children are older- you can help them IF they need you to by asking questions.... like What is happening? Who do you need to talk to? What would you like to see happen? How can we solve this problem? 4. Climbing up the Slide will mostly likely cause FAILURE! Children need to learn how to try, try, try and FAIL. They need to realize that not everything always works out the first time. Climbing a slide is the perfect situation for failure. Children ultimately do not make it to the top the first time. When they slide down, they have the opportunity to consider other options- come up with a plan, and continue to try until they succeed! 5. Climbing up the Slide encourages CREATIVITY AND COOPERATION! Climbing up the slide is not easy, and sometimes children will need a little bit of help to reach the top. When children are faced with failure and have the skills to problem solve- they will get creative. They will find a solution- and often times utilize other tools and ask others for help. I have seen so much growth and teamwork happen while climbing the slide! 6. Climbing up the Slide also encourages SUCCESS! Most children will eventually find success in climbing up the slide. They will experience this from their hard work and their ability to stick to it! It helps them gain a sense of pride and confidence in their own abilities. 7. Climbing up the Slide builds TRUST! When children are allowed to do things that involve potential risk- they learn to trust in their own abilities, in their own bodies, and it shows them that the caregivers around them trust them too. Your action of allowing the children to try tells them that you trust them to try, you trust them to succeed, and you trust them as competent problem solvers. I hope you are ready to climb up the slide now too! You nailed it! Every child knew slide is designed for climbing. Unfortunately, I work in a center where they don't allow kids to climb up the slide! I'm always delighted to see kids keep doing it no matter how many time those anxious adults tell them not to. At the same time, I'm also frustrated because I'm compelled to discourage the kids to do so. I'm definitely going to share your post with my co-workers and hope it will spark a change! I am so glad I found this post! I agree 100% with every point. I hate the looks I get at the park when parents see my children go up the slide, but I will not budge. I always let them go up the slide, AND remind my kids to be mindful of other children around. They know when someone is coming down they have to wait. But then I hear other Moms telling their children (who are trying to go up the slide) "slides are for going down," "it's not safe," rules, etc. Then mine go and immediately climb up first chance they get. When I first decided to go with my gut and allow it, I did feel bad and felt like a bad parent when I got "the look" from other parents, but now, as long as my children are taking turns and being respectful, I let them climb up. They gain so much more physically and intellectually by doing it the "wrong way." Yes! Yes! Yes! I love this. Part of the reason I stopped working in a large daycare was because of the rules that limited the kids every which way they turned. Such a simple thing that is so important! I find it obnoxious when kids at the park are climbing up the slides. I understand your point, but there are PLENTY of other situations at the playground where kids can experience risk and conflict resolution. Going up the slide is just RUDE! All the other kids at the top, who went up the stairs and waited their turn, now have to wait for the child who decided to bypass the line and climb up the slide. I no one else is at the park - fine- go up the slide all you want. Otherwise I'm constantly the parent telling your kid to stop climbing the slide and go up the stairs!!!! Although I see where you're coming from, I have always discouraged my children from climbing up when playing with others. It is not a matter of saftey, it's a matter of manners. The slide was meant for desending. Kids should be courteous to one another just as adults should. When in our own backyard however, my three children are encouraged to "go crazy", and climb up, hang from, and backwards glide down their slide. Who cares? It isn't bothering anyone.. so for us it really is just about displaying common courtesy, and not allowing my children to be the ones mauling and running over the others. 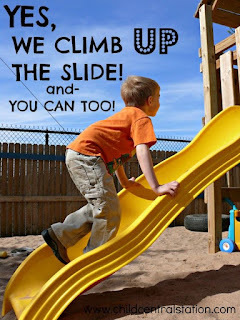 I agree that the slide was made for descending; however I can see how climbing up the slide is fun for the children - it might be the fun of breaking the rules LOL - building muscles and practicing the climb. I'm wavering on how steadfast I will be on the playground when my children decide to climb up the slide. I do believe that it needs to be done in a respectful manner to those who want to come down. I guess first come first serve would take precedence over who has the right of way. I'd like to know your position on bringing toys on the play structure. I'm kind of steadfast against that as well unless its a teacher directed activity to learn about ramps and speed. But children in the past have taken to throwing toys from the top of the structure which is very dangerous for those below. How do you handle toys on the play structure? Newer playgrounds have specific climbing apparatus so there is no need to climb up the slide.....I agree with the comment on manners. Waiting your turn teaches manners and respectful behavior. Yes! I love this and agree 100%. I don't think it's rude for kids to climb up the slides. If a child is waiting to go down, the kids can communicate and come up with a solution without an adult jumping in to fix the issue before the kids have an opportunity to solve the problem between them. As adults, we don't always have someone jumping in to solve our problems. Sometimes, we need to speak up and discuss a solution. Adults seem to over assign rules to avoid conflict. Kids need conflict so they can learn how to deal with it in a healthy way. Maybe kids will resolve a slide issue by agreeing to climb up and walk down the stairs. There are so many ways children can resolve these issues. This is beautiful. Climbing g up the slides is awesome for every reason you stated. I let my child climb up the slide as well. It isnt rude to climb up if no one is trying to slide down. Just because a slide is meant for descending doesn't mean that's all it should be used for. 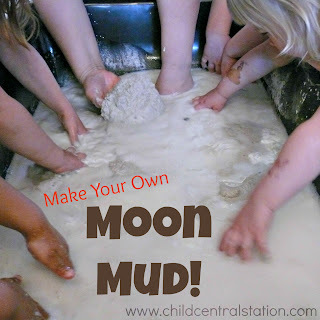 teaching children to use what they have in front of them for many purposes is awesome at creating scientists, inventors, and out of the box thinkers. We need more people to encourage actions like this and stop inturrupting children at play. Their play is hard work and teaches them lots... we should take a good look at how kids see the world and impliment that vision in our adult lives more often, we might learn something by climbing UP the slide. We all have rules we must follow. Society is no different. First, let them crawl up the slide. (Never mind the others who have been waiting their turn on the steps). Do we let them cut in line at the movies or run over you because they want to ride their bike where you are walking? I disapprove of any practice that tells kids they do not have to take others feelings into account. Agree completely. Lots of kids today don't need any encouragement to disobey rules. My own children were also allowed to climb up the slide at home & at the park~providing we were the only ones there. If others were there, it was not an appropriate time to go up~ only down. However, when you have a preschool with 90 kids, it is NOT ok that kids be allowed to climb up he slide. There are plenty of other places to climb....dome monkey bars etc. no matter how vigilant teachers are,you cannot be too careful on the playground! After all it is our job to keep children safe! My students and daughter feel so powerful when they achieve the goal of climbing up the slide ( or the bilco doors). Children even help each other by standing at the top to help the others up. Its so wonderful to watch. I do think at the playground its difficult to decide whether or not to allow it because so many parents adopt the "no climbing up the slides" rule. Then we try to be respectful as we can of their feelings and beliefs while still enjoying the equipment the way we normally do at home. Sometimes that means not to climb up at all (if the parents seem really worried or adamant, or only do it when other kids aren't around, or just monitored turn taking. I agree! At home...great. Yes! Climb up. All day long. At the park or at preschool. Not fair. Too many kids. And it's the same kid or 2 that wants to remain 1/2 way up the slide the whole time. If there are 2 slides, then maybe make the less "fun" slide the climb up slide, but still, you climb up then move on. You don't get to linger 1/2way up the slide. The beauty of the decent is after you slide down, your turn us over. Climb uppers don't do that. Why? Because there r kids at the top waiting to go down. They mostly climbed up the slide to bypass waiting line anyway. I agree with you! A busy place isn't the time for this. And when there is a tunnel or a curve, the child coming down doesn't know a child it coming up and there is a crash. Great article for when you are in your own backyard or an empty playground. Uh. Is this really an issue? Are parents out there policing the bottom of the slides? I just let my kids go nuts on the playground and keep an eye out to make sure they don't start doing something likely to crack their head open. At most, I've probably asked them to stop climbing the slide of someone else is about to slide down. They don't need sneakers slamming into their face, and the slide is one of those "taking turns" sort of items. Awesome!!! We climb up the slides but I hadn't really thought about all the benefits. Thanks for pointing the out. I completely agree with your comment! Thank you for being a parent who days what they mean!!!! I feel the same way while at the park with my son EVERY TIME , it NEVER FAILS!!!! So I appreciate the fact that you are a patent who is concerned and proactive about your child's/children's manners ! Thank you!!! Sorry , lol, auto correct keeps getting me! ***Parent (not patent) ! I'm not sure how not climbing up the slide teaches manners. Taking turns does and learning how to negotiate who goes next does. When my kids climb the slide they aren't allowed to climb all over or maul others any more than the ones going down are allowed to. It's all about who goes next, just like at a four way stop. Now if we can just get our licenses to understand it's not a lack of supervision to alow children to engage in risky play.